Can you customize this mod for me to suit my overly specific request? Can you add a bunch of extra stuff that will make this mod buggy, script-heavy, and messy? Can you make this unrelated mod I thought of? Can you make a patch for X mod? If I use it, maybe. If not, no. Will you bring this mod to consoles? If possible, yes. If not, no. This mod is pointless, and I'm going to explain why at length. Don't bother. Also, this is not a question. This mod is not lore-friendly, and I'm going to explain why at length. Does anyone have an alternative to this mod that's more up-to-date? me trying to snipe suddenly, boom, companion standing in front of me. like theres 360 degress area around me, and it chooses to stand right infront of me. when im trying to snap, or close combat. like wtf. These parameters can be changed on the fly through the console. But I don't know how quickly the changes start to work and should I load a save or not. When I had only a dog in my companions, I didn't see a difference, or so it seemed to me, and now I have a few people (Unlimited Companion Framework) and I've decided to try it again. Quite often I've wanted this to be more effective. Yesterday, skulking around college square, Dogmeat CONSTANTLY ran up to get in my way. It was literally infuriating. As you have noticed by now, he still does. He just gets back out of the way. Good enough! Shame this doesn't increase the detection range of following Austin for that tour of Vault 81. I'm not talking about the quest breaking it you talk to someone else, I mean having to huggle up close to him despite companions getting in the frigging way. 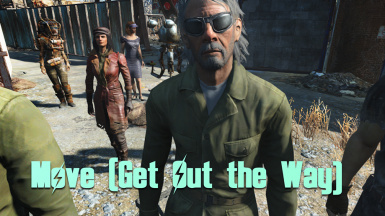 ...and I thought each NPC had a different distance setting from me;...Cait giving me the reach around, Dogmeat nosing my giblets, Danse winking at me through my weapon scope, and Strong commenting on how I smell funny...sheesh! I have literally power-attack falcon punched my own companions because they kept running right in front of me at point blank range while I was trying to scope snipe. I have come very close to throwing my entire computer out the window in rage. Thank you for this mod, you have no idea how angry I've been before finding this. Thank you, Sturges will NOT get the hell out of the way. He sure will now. man,u just saved my day. Adding a option to control how close others would be nice. Dogmeat I feel stays to far away from me. 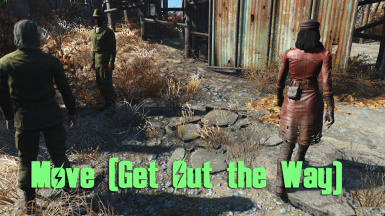 Decided to remove the mod, it makes Dogmeat and other NPC's stand too far away from you. The final straw when Dogmeat jumped into the river to swim while I was standing by the side. Mod works never the less, just feels like there is a invisible bubble around me that pushes everyone away. HOLY s*** THAT'S EXACTLY WHAT I WANT! You haven't had companions go on idle & literally bump into you?